Bankruptcy: It’s good for your health! The human side to insolvency is often ignored. The human side of insolvency is often downplayed in our written communications as we often focus on offering insight on the intricacies of the Bankruptcy Act 1966, the Corporations Act 2001, or some recent court decision. But the truth is, as insolvency practitioners, every day we see the emotional, physical, and mental impact that financial problems has on many different types of people. We predominantly meet people when they’re at their lowest—those people are either running a business that is failing, or struggling with their personal debts. People’s stress can manifest in many ways, from feeling ashamed, angry, in denial or in a state of fear. Having myself been an honorary treasurer of Mutual Self Support in Mental Health, and having worked with several financial counsellors for years (they assist the most vulnerable sectors of society), I can unequivocally say that constantly worrying about bills and one’s financial future is far more toxic than any adverse credit report, which results from declaring for bankruptcy. 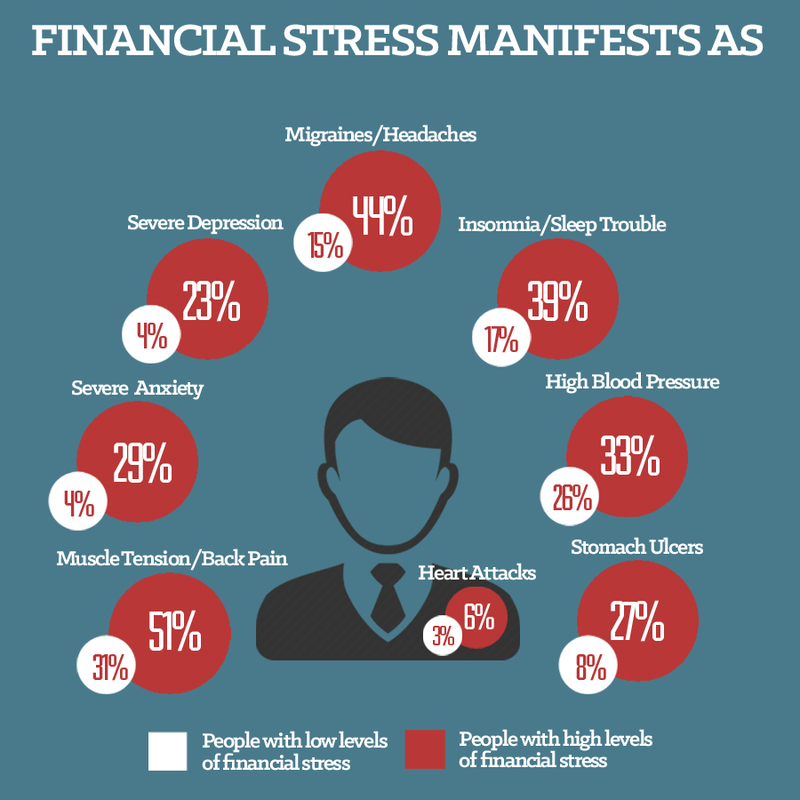 This position is supported by a poll conducted by Associated Press-AOL Health (admittedly in USA) which shows the toll that financial stress takes on the body. The study compared different health conditions in populations with low levels of financial stress against those with high levels of financial stress. You will see that the image below speaks a thousand words. We find that the idea of bankruptcy or liquidation is often blown out of all proportions in a person’s mind when we first meet with them. The reality is, that insolvency laws are not designed to be punitive—they are intended to provide relief. Going bankrupt is not usually anyone’s first choice—nor should it be. While it provides recovery avenues for creditors, it also crystalises the debts (stopping interest or fees from compounding or accruing) and relieves the debtor of those debt obligations and allows them to truly start over. Bankruptcy legislation also specifically provides exceptions and exemptions to ensure that bankrupts can maintain a decent standard of living and earn an income. I also want to mention a sombre story. A few years ago, I was scheduled to meet with a young man who ran a plumbing business as a sole trader. That business owed the Australian Taxation Office around $100,000 which it could not repay. This man’s distorted view had him believe that his wife and two young kids would be out on the street if he declared bankruptcy. Tragically, he took his life before our scheduled meeting (where I may have hopefully been able to convince him the problem could be solved without losing everything). I hope to never receive that news again. If you have clients that are struggling financially, they need to know there are options to assist. As soon as people can understand how insolvency law can help them, and what the actual net affect will be on their life, the toxic stress both emotionally and physically, can start to be alleviated.